Grapes need a good pruning each year. They produce more grapes when properly pruned. While there are different methods for pruning grapes, I keep grape pruning pretty simple. I focus on a number of “lead” vines and hack pretty much all side shoots off. As you can see, I clipped off a lot of the plant, probably more than 50% of the total vine volume. You really shouldn’t be afraid to give a grape a good hard prune. Above you can watch professional guidance on the topic if you want to go beyond my basic approach. Exciting news! The orchard mason bees have arrived just in time. 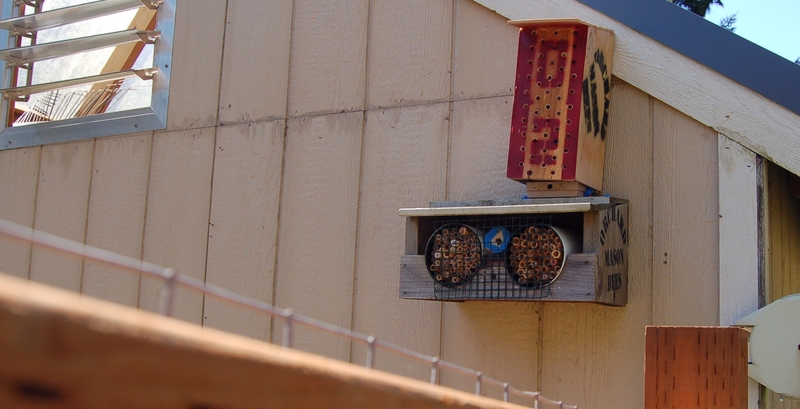 A local mason bee expert uses our yard to harvest mason bees each year. Steve, the bee guy, dropped off the bees this week and they’ve already hatched. We benefit from having a nice colony of bees in place to pollinate our orchard and Steve gets to keep all the baby bees for next year. It’s a great arrangement. My babies are growing up! Today was a nice sunny day so I took my seedlings out to the greenhouse to begin hardening off prior to planting. Just in time, too, because I need to start seeding the next wave of crops (cucumbers and squash) ASAP! And I’ll end today with a recommendation for a great garden tool. A thermometer! A number of plants require the soil to warm up to certain temperatures before planting. The easiest way to find the temperature is with a basic digital thermometer. This is a simple, cheap kitchen thermometer, but it does the job well. This entry was posted in Gardening and tagged and thermometer, basil, corn, grapes, orchard mason bees, peppers, pruning, tomatoes. Bookmark the permalink. 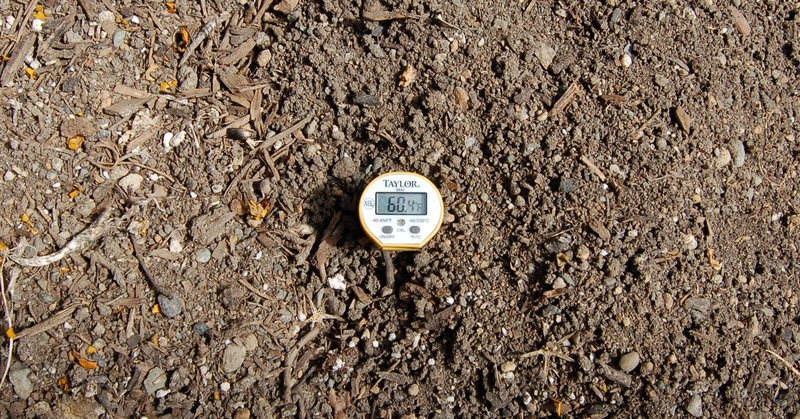 How silly is it that I never once considered sticking a thermometer in the ground?! Thank you. I always hate starting a pruning job (on any plant) but then love the end result. I think I always just worry myself into second guessing my choices but should really just have more confidence. Exciting news about the bee arrivals. Our mason bees hatched out this week and hopefully they will survive and use our nest box for the next generation. I have been remiss in not using my soil thermometer lately and should be. I will pull it out though before planting beans – which like to pout and rot in cool soil so knowing it is warm enough first before planting is always a good idea. Little Sis, the thermometer seems so obvious once you think about it! I learned the tip from someone else (can’t remember who) myself. Laura, pruning is one of my favorite gardening tasks. It must be in my blood. My dad and paternal grandfather both worked in orchards for years. I have no fear when I’m pruning and do a pretty good job of visualizing the shape the plant should take. It’s amazing how a plant can be so quickly transformed with a few clips here and there. 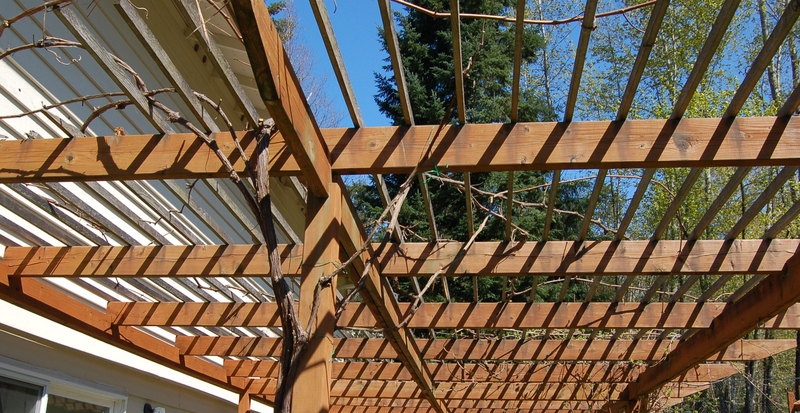 The only pruning I don’t enjoy so much is pruning that must be done overhead, such as the grapes over the pergola. Hi Debbie! Great to hear from you. Since what you want is a lot of lush green, I’d only prune to shape them and keep them under control. The hard pruning is really about maximizing fruit production. Even if you prune just lightly, you’ll still get fruit, just not as much. I saw on FB that you were moving. Congrats on the new apartment. That’s so cool you have grape vines in your urban setting!